Lake Chalice: Warehoused Elderly: How Will Our Great-Grandkids Forgive Us? Warehoused Elderly: How Will Our Great-Grandkids Forgive Us? 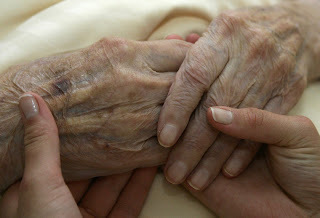 "Nearly 2 million of America's elderly are warehoused in nursing homes, out of sight and, to some extent, out of mind. Some 10,000 for-profit facilities have arisen across the country in recent decades to hold them. Other elderly Americans may live independently, but often they are isolated and cut off from their families. (The United States is not alone among advanced democracies in this. Consider the heat wave that hit France in 2003: While many families were enjoying their summer vacations, some 14,000 elderly parents and grandparents were left to perish in the stifling temperatures.) Is this what Western modernity amounts to -- societies that feel no filial obligations to their inconvenient elders? Sometimes we can learn from societies much poorer than ours. My English mother spent the last 50 years of her life in Ghana, where I grew up. In her final years, it was her good fortune not only to have the resources to stay at home, but also to live in a country where doing so was customary. She had family next door who visited her every day, and she was cared for by doctors and nurses who were willing to come to her when she was too ill to come to them. In short, she had the advantages of a society in which older people are treated with respect and concern. Keeping aging parents and their children closer is a challenge, particularly in a society where almost everybody has a job outside the home (if not across the country). Yet the three signs apply here as well: When we see old people who, despite many living relatives, suffer growing isolation, we know something is wrong. We scarcely try to defend the situation; when we can, we put it out of our minds. Self-interest, if nothing else, should make us hope that our descendants will have worked out a better way." Time was, not so long ago, the period from retirement to death was, on average, much shorter than it is now. The average person retiring today will spend more years in retirement than in childhood and adolescence combined. Time was, not so long ago, that nursing homes were not-for-profit operations generally run by churches. For-profit corporations saw the profits to be made from warehousing the elderly through the many extra years which modern medicine now provides (while often not providing the combination of vivacity and financial means to live independently). One by one the not-for-profits were bought up by profit-making interests. We know that there’s something wrong with the current picture. We know that an older person with many living relatives shouldn't be suffering isolation. No one defends that. Mostly, we put it out of our minds. What are we thinking? This is part 6 of 7 of "The Future Will Judge Us"
Next: Part 7: "Environment Destruction: How Will Our Great-Grandkids Forgive Us?" Previous: Part 5: "Industrialized Meat: How Will Our Great-Grandkids Forgive Us?"